The real estate industry is becoming more competitive as time goes on. It is becoming increasingly difficult for real estate companies to establish a strong digital presence. Everyone wants to increase lead generation and appear in the top of the Google search results. In this blog post I will be going over my top 5 digital marketing tips for real estate that will help give you a competitive edge in an ever-changing digital world. Building a website for your real estate company is one of the most important things you can do. If done correctly, you will generate more high quality leads. Whether you are running paid ads for social media or Google, a well built out website is the first step towards success. That’s why it is so important to have a visually appealing, easy to use, mobile friendly website. A lot of relevant content/useful info. Since this isn’t a blog post about web design, I won’t go into detail about each point. These points are very important if you want to increase quality lead generation and rank higher in search engines. One point I did want to talk more in detail about is using relevant keywords throughout your site. Keywords are the building blocks of SEO. It’s crucial to target the most relevant keywords in order to create an effective strategy for SEO. For example, if you are a home buyer you should have keyword phrases like “Sell Your House Fast In Philadelphia”. This allows your website to populate organically for people who are using these search terms in Google. 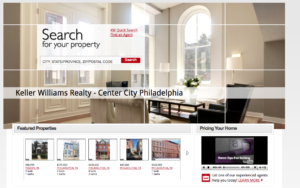 Keller Williams Realty Inc. is a great example to follow when building your real estate website. Their website shows that they are using the proper keywords to target certain areas where they buy and sell homes. They also have listed feature properties within their location which will help their site populate organically for local searches as I mentioned earlier. This will not only improve their SEO but also capture quality leads. If you have time check out their website, they are a great example of what a proper real estate website should look like. People have so many questions when it comes to real estate, whether its buying or selling a home. This is a perfect opportunity for you to provide helpful content that people can use. This will not only lead them to your website and turn them into prospective customers, but also provides you the chance to build brand awareness and trust. A great example would be to create a blog page on your website. Make the title of the blog posts questions people would typically want to know about real estate. For example, a title for a post could be “Should I Trust Zillow To Determine My House Value In Philadelphia?”. Answers will differ based on location, so make sure to include landmarks in you posts (also helps with SEO). More examples would be to create YouTube videos, create infographics and even post tips on your social media channels. Once you begin to optimize your content, you will start to rank higher in Google’s search results. Differentiating yourself in the real estate is critical due to the competitive nature of the industry. You need to set a tone for what you do well and stick to it. A good example would be real estate agents who only sell certain homes in specific areas. You want to be very clear with the type of homes, areas, and price ranges you deal with. You don’t want to be vague with details of what you do on your website, otherwise you will get many useless leads. It is important to be explicit with what you do for obvious reasons. Remember to embrace what you are best at and people will begin to notice. This is what’s going to make you stand out from the competition. Since the majority of prospective customers will be using their phones or computers to search for real estates, it is very important to have quality campaigns for PPC (pay-per-click) and SEO. Regardless of what your company does in real estate, people will be searching keyword phrases related to your services. Location is extremely important when it comes to search. If you think about it, it is very likely that someone will type into Google “real estate agent [city]”. This is something to keep in mind when bidding on keywords. When it comes to SEO, everyone wants immediate results. The simple fact is SEO is a marathon, not a sprint! Although, using the correct methods can save time and increase lead generation. For example, when using Google AdWords keyword planner tool, in Philadelphia there is an average of 22,200 searches for the keyword phrase “houses for sale”. This shows how many people are using Google as a resource to find houses for sale, and the potential customers you can capture if you properly optimize your website and paid ads. In an ever changing digital world, social media is a must for your real estate company. You can now share new listings and updates of what’s available instantly with all social medias. Best of all it’s FREE! I believe the 3 must have social media accounts for your real estate company are LinkedIn, Instagram, and Facebook. You must be posting on these accounts consistently, while posting on other social media platforms such as Google+ and YouTube less frequently. It is great for real estate because you get to post images as often as you want. People respond best to 360-degree photos and videos. Being able to view a whole house without leaving their computer puts you at a huge advantage! If you can hire a professional to create a 360-degree virtual tour of your properties, this will help differentiate you from the competition. Facebook now allows you to post these 360-degree photos and videos, which is an amazing feature for your real estate page. Whether you are buying or selling property, it is great to have a place to post pictures where potential customers can discover your company. Brittany Nettles, a successful realtor at Keller Williams Realty Inc., is using social media to brand and market herself in the local Philadelphia market. It is important for anyone working in real estate to use their own personal social media accounts to build a strong brand for themselves, so they can build trust and close more deals. 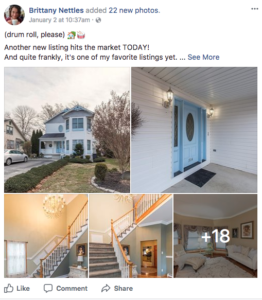 If you take a look at her Facebook page, you will see that she is posting pictures of the newest listings and taking advantage of the free marketing social media has to offer. My last example is Ed Stulak. He is a successful realtor that is branding himself as an entrepreneur. If you take a look at his Instagram, his posts include the most recent listings and life related events. He is not only building a strong reputation as a realtor but as an entrepreneur. As his social media following continues to grow, he will continue to gain recognition in the New Jersey real estate market. From a company standpoint Keller Williams Realty, Inc. has all social media channels properly built out. Thier Facebook page even links out to their Instagram, Twitter, and YouTube pages (Sceen Shot Below). Keller Williams would be a great example to follow for your own real estate company. They are posting daily to each account, all of their content is informative and they are properly marketing all new listings via each social media account. There are many ways to build a strong digital presence for your real estate company. It can be overwhelming, but if you take it step by step you will notice more high quality leads filling up your inbox. My advice would be to first focus on your website then move on to the next steps like paid ads and social media. With these 5 steps you will a develop a stronger brand and drastically grow your business. My name is Dave Lacamera and I’m a Paid Search & SEO Specialist here at Momentum Digital. If you have any questions about digital marketing tips for real estate feel free to contact us at any time! Also, a big shoutout to successful realtors and entrepreneurs, Brittany Nettles and Ed Stulak for allowing us to use their social media accounts as awesome examples to follow. You can reach any of us at the email or Instagram handle below. Fill Out Our Form For Your Free Cash Offer!